Research using CNC has found that teenagers who read in their spare time know 26 per cent more words than those who never read. Researchers from the Centre for Longitudinal Studies found that teenagers who read often, and those who had access to plenty of books, were more likely to develop a better vocabulary. The study looked at a vocabulary activity you did when you were 14. Your parents also did the same activity, so researchers could explore whether their English language skills were passed on to you. 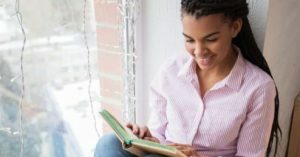 After analysing the scores of the word activity, the researchers found that teenagers who read for pleasure every day understood 26% more words than those who never read at all in their spare time. And teenagers from homes with lots of books available knew 42% more words than those who had grown up with fewer books.